For over 25 years FUJIFILM Irvine Scientific® has been a world leader in providing a comprehensive range of pre- and postnatal cell culture media for cytogenetics diagnostic. 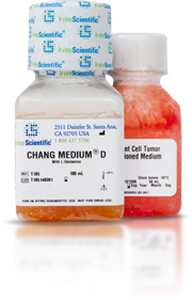 CHANG Medium® is considered to be the gold standard for primary culture of human amniotic fluid cells. TRINOVA BIOCHEM offers advanced Cell Culture Media and Supplements for expansion and maintenance of primary cells and cell lines. With the rising of cell therapy & regenerative medicine the demand for serum-free cell culture media increases. 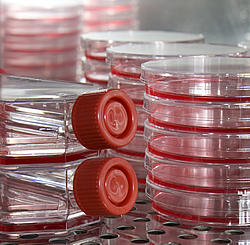 A broad portfolio of cell culture media and supplements is meeting this demand. CRUX RUFA Human Platelet Lysate - a xeno-free alternative to FBS (Fetal Bovine Serum). Available in GMP-Quality. CellExpand™ - for expansion of specific lympho-hemtopoietic stem cell populations. All growth factors and cytokines are readyly included. HemoGro™-SF - a chemically defined, complete base medium. 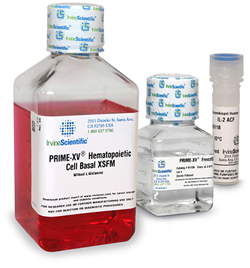 FUJIFILM Irvine Scientific® offers the PRIME-XV® Media Portfolio comprising xeno- and serum-free expansion and differentiation media for utilization in cell therapy and regenerative medicine. The validated media and supplements are manufactured under full cGMP conditions and fulfill CE regulations. Quality and regulatory accordance is a matter of course, as FUJIFILM Irvine Scientific® is grounded in assisted reproductive technology (ART), cytogenetic applications and industrial cell culture.